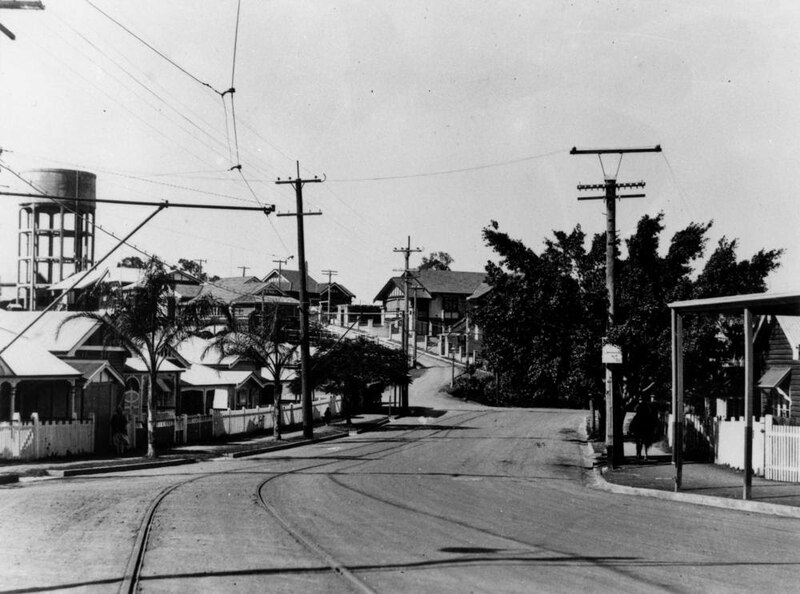 One of Brisbane's earliest settled suburbs, Paddington is densely populated across its many ridges and valleys. It was originally part of the town of Ithaca, but the Paddington suburb name prevailed whilst Ithaca did not. Paddington contains a large number of houses known as Queenslanders that were designed for our hot and humid climate. 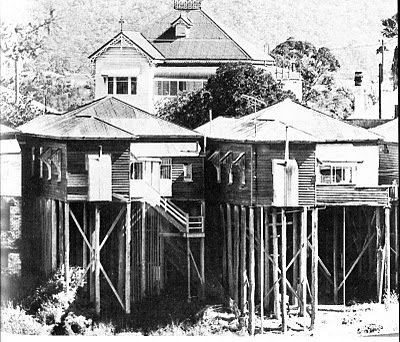 Many of them in this location were built on stilts owing to the steep terrain. High supports enabled the rear of the house to be raised to street level despite the severe slope - here's an extreme example. Getting water to the higher areas of Paddington was difficult until, in 1927, a water tower was constructed up in the heights of the suburb to give gravity a hand. Here is a photograph of the water tower taken from Macgregor Terrace around the year 1929. The tower was designed and built by the Metropolitan Water Supply and Sewerage Board on Archibald's Hill, some 100 metres above sea level. The tower itself is over 21 metres high, holding 100,000 gallons of water; it cost £12,000 to build. 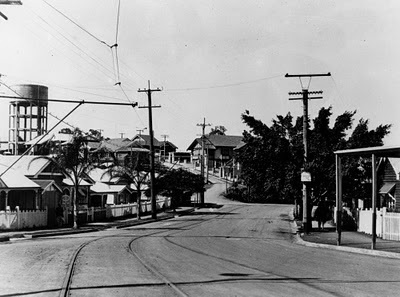 The water came in from Enoggera Dam and was pumped into the tower by an electric pump driven by the power grid that supplied electricity to Brisbane's trams. 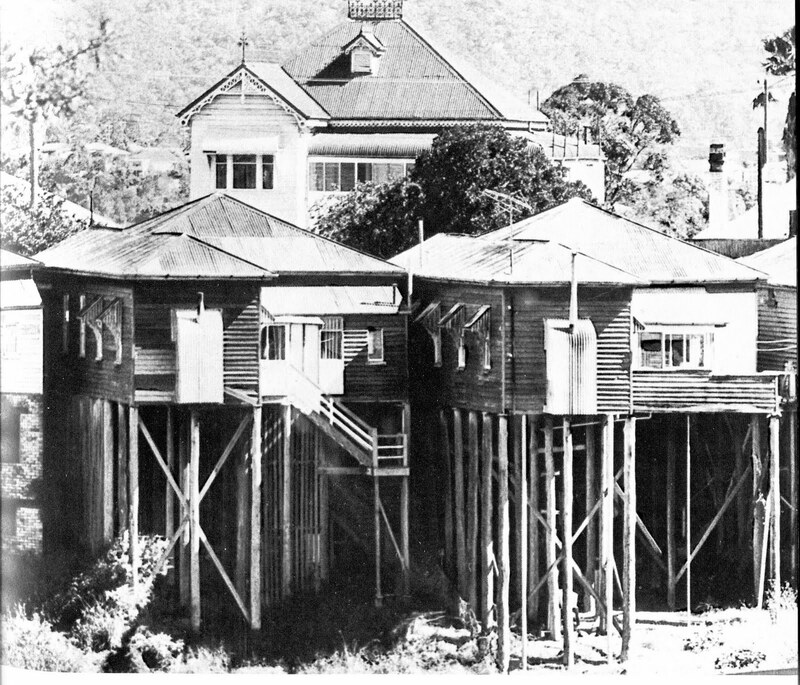 This was one of several water towers constructed around this time in such suburbs as Albion, Enoggera and Tarragindi. The Paddington tower is somewhat different in that it has been built on concrete columns, and it may be the only one of its type in Queensland. Here is a current picture of the tower and its surrounds. Here it is again, this time taken from a slightly different angle. The water tower is no longer in use, but the exterior of the tower is being kept in good condition as the tower is heritage listed. I love the second photograph from 1929. Somehow the houses, despite the looming tower and the tram lines that imply the coming modern city are homely, and project a small town walkabout, connectedness. Much like young Jimmy Stewarts home town in "Its a Wonderful Life" before it becames Pottersville. I also love that tree that seems as it is captured by the photograph to have taken over half the road, trams and cars be dammed. Yes, I agree - the photograph suggests a simpler time.